Mumbai : Wonder how Hrithik Roshan remains cool, calm and composite in real life? Well, he shared a moment of cuddle therapy on social networking site with his super cute buddy, Zane. Hrithik Roshan captioned his image on Instagram, "It seems that I'm his favoured cushion. #cuddletales #thezanechronicles"
Hrithik Roshan can be seen wearing a black jacket, relaxing and smiling in the picture. Zane had come into Hrithik’s life in August this year. "Zane has become my 'hug buddy'. He is always ready to give love. Ray n Ridz (Hrehaan and Hridhaan) wanted a name that wasn't an obvious dog name, and more of a human name. Zane is loving. He is a bundle of joy," the actor said in an earlier comment. The actor is currently busy working for his upcoming movie 'Kaabil' alongside Yami Gautam. The film has been scheduled to release on January 26, 2017. # Hrithik Roshan shares a picture on Instagram with his pet Zane. 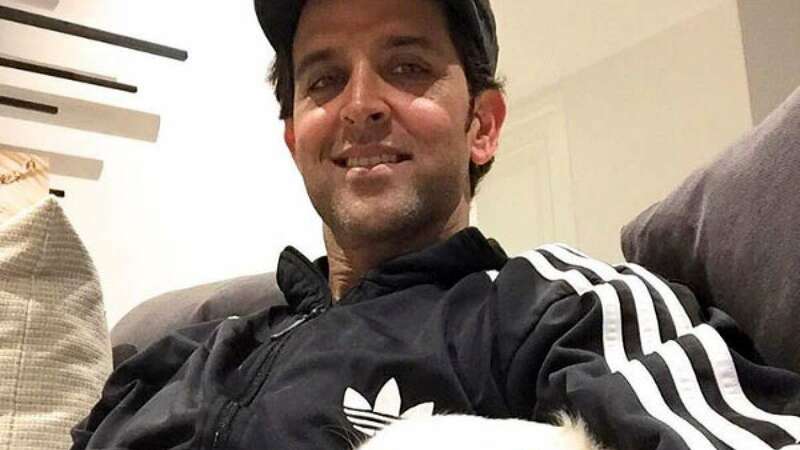 # Zane is seen sleeping on his lap as Hrithik looks dashing in a black jacket. # He is currently working for upcoming movie Kaabil alongside Yami Gautam. # Kaabil is scheduled to hit the silver screens on January 26, 2017.